Andrea diagnosed with MDS RAEB-t type at the age of 29 was treated with bone marrow transplant in 1994, but relapsed a year later. With 5% chance of success, she was advised against the second transplant. Following a gruesome period of intensive chemotherapy treatment, she fought to have a last-chance treatment called donor lymphocyte infusion (DLI). 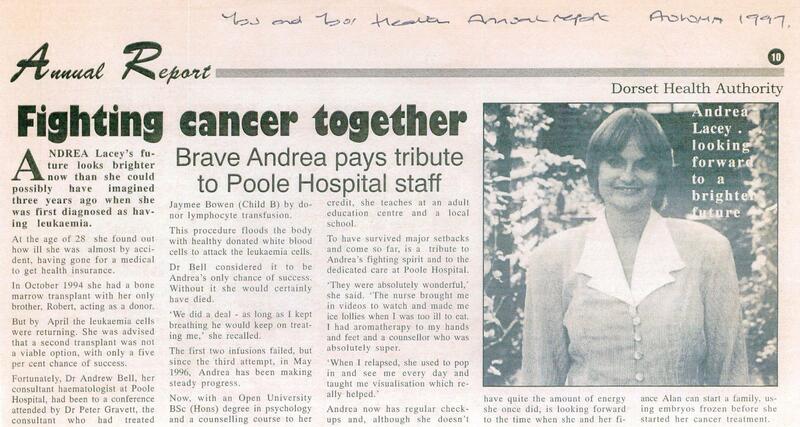 In fact, Andrea was one of the first patients in UK to have this pioneering (at the time) treatment. Since completing her final successful DLI procedure in 1997, Andrea have led a relatively healthy 20 years with just the usual side effects of BMT to manage. Andrea wants to use her experience in a positive way and hopes her story may help others. "I was determined not to die! (…) My consultant and I discussed the options [and] came to an understanding that whilst I kept on breathing he would carry on treating me. I was very afraid the NHS would give up on me because of the expense of all the treatment and so getting this agreement from him was so important to me. However, the options were not great – we could do nothing and let the leukaemia take its course, have more chemo with little realistic chance of survival, or try a brand new treatment that hadn’t actually been successful yet. That was the option I took; the donor lymphocyte infusion." I have been clear of MDS and Leukaemia now since 1997, but have rarely shared my story. Over the years, I have found it difficult opening up my ‘Pandora’s box’ of things (ie diaries, newspaper articles, letters and so on) from that time and it wasn’t until last year that I was able to do this more easily and this was driven by two main things. Firstly, I have a very good friend who is going through leukaemia and I was curious to compare his bone marrow transplant procedure with mine, some twenty years earlier. Secondly, I was diagnosed with breast cancer in March 2014. Now, just over a year later, I have completed my breast cancer treatment. Fortunately, I was able to have more chemotherapy and radiotherapy, although there was a bit of a question mark concerning this at the outset. Better still though, it seems to have worked and the results from my mammogram last month showed no signs of cancer. I am now making a gradual return to work and some normality. In 2008, I wrote an article for an American MDS Journal. It’s a bit long winded, but this is a copy of the article I sent to them for publication, which you may like to read…..
As I write this now I am well and my illness seems almost as if it didn’t happen to me. I have had a complete life change and this has not necessarily been a bad thing. Prior to being diagnosed I was working as a manager with British Gas and studying for a psychology degree with the Open University. My studying was something that was very important to me when I was ill and it also provided a very good distraction when I was able to go home, but not well enough to go out and about. I have since complete numerous other courses and also have an MA in Education. I now work for Bournemouth University and also for the Open University where I lecture on several different psychology related courses and I am loving it. 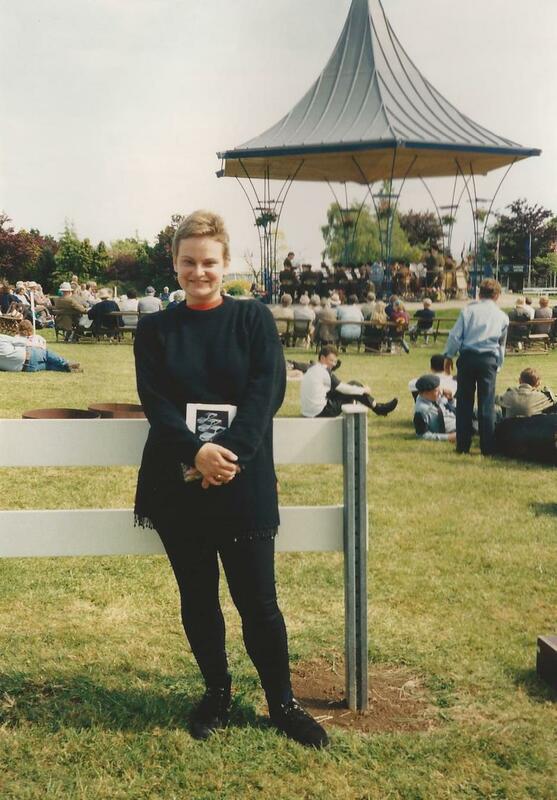 My story started in January 1994 when I went to my doctor to have a medical so that I could get some life insurance and I found out that I was anaemic, had a heart murmur and was generally unwell. My doctor asked me to go for some blood tests. This was followed with more and more tests, until I was asked to go for a bone marrow test and this followed by more and more bone marrow tests! After one of the tests I was asked to ring for the results. My GP told me he didn’t think I had leukaemia, but that it could be. I was devastated – I was only 29. Anyway, myelodysplasia (MDS) was diagnosed and more explicitly RAEB-t and the t (transition) bit was already on the move! My consultant at the local hospital told me my only chance of survival was a bone marrow transplant. At this point I was beginning to realise how very rare MDS is and I knew it was the first time my consultant had been involved in treating somebody so young with the illness. I trawled the internet to try and find a story or case study where someone had managed to come out the other end alive, but there wasn’t one! I can’t begin to explain the ups and downs, or the desperate feeling of misery I felt at that time. From diagnosis to the treatment I knew I had about 4 months and this was the amount of time needed to find a donor and to try to come to terms with what was going on. Following each hospital visit I would exist in a shell-shocked state – I can’t think of the words to explain it, but it was surreal. I have one brother Rob, who at the time was 25 (5 years younger than me) and following tests we were told he was a suitable match to be my bone marrow donor. This meant that I started treatment with 40% chance of survival. Knowing where the starting point was, meant I was able to start the challenge to live. I worked out that as most people with MDS are older, I stood a very good chance of being part of the 40% that did live. My partner (at that time) and I bought loads of fruit, vegetables, self-help books, went on long walks and did practically anything we could to give me a good start for the treatment. I worked on the basis that it would only be a couple of weeks in isolation and then about 6 months off work and that would be it; a very small amount of time out of a lifetime! Actually it didn’t work out like that at all! The transplant treatment wasn’t successful and there were still some MDS cells that hadn’t been killed by the total body irradiation and chemo. My consultant explained that a second transplant wasn’t an option because of the damaging effects the chemotherapy had already had on my body and so it was a case of damage limitation – trying to control what was happening and buying enough time in case a new treatment came out. There is so much more I could say about this time and although it was all so desperate there were some very funny times. To cut a long story short my consultant tried for a year to keep me going with maintenance treatment. This involved bags of blood and so many types of drugs; at one point he thought the cancer had gone. But in May 1995 the MDS was back and I started a treatment using stem cells and leucocytes that were donated by my brother. This treatment seemed to work and in November a bone marrow test showed 100% my brother’s bone marrow. We had a party that night! By December, I was beginning to feel rough again and developed pleurisy whilst on a trip to France. I shouldn’t have gone on the trip really and I felt so ill. I really wondered whether I would be going home again – it was awful! 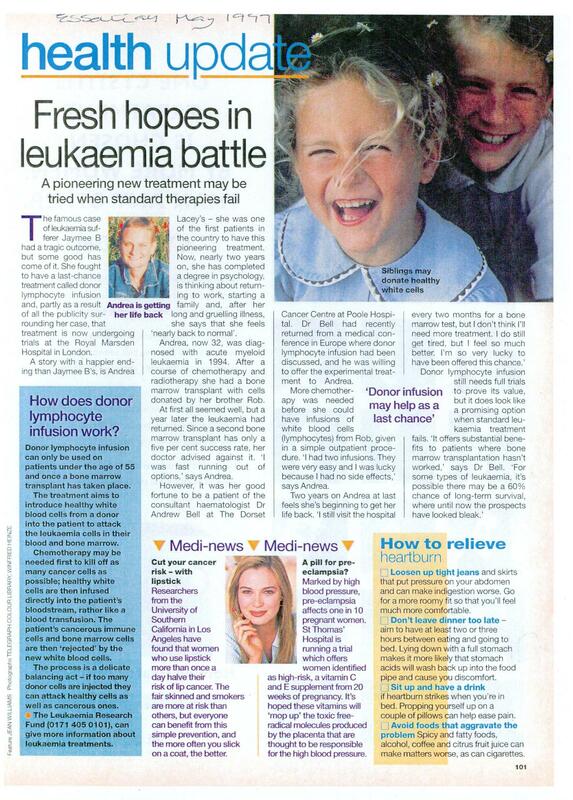 In January 1996, I had another Bone Marrow Test and this showed I had Acute Myeloid Leukaemia. As I couldn’t have another bone marrow transplant, the only option was more chemo. So I went back into isolation and this time it really was serious; I had 5% chance of survival. However, I was determined not to die! Mega doses of chemotherapy were followed by weeks and weeks in isolation. I not only lost all my hair and nails again, but also the skin around my teeth and in my mouth. By now I was being drip fed and was on a morphine pump. I had reached a really horrible place. My consultant and I discussed the options. We came to an understanding that whilst I kept on breathing he would carry on treating me. I was very afraid the NHS would give up on me because of the expense of all the treatment and so getting this agreement from him was so important to me. However, the options were not great – we could do nothing and let the leukaemia take its course, have more chemo with little realistic chance of survival, or try a brand new treatment that hadn’t actually been successful yet. That was the option I took; the donor lymphocyte infusion. I received the treatment in May 1996 and from then on it was a seemingly never ending circle of bone marrow tests, blood infusions, drug infusions, tablets (32 different types at one point), bronchitis, pneumonia and so on. However, in February 1997, I got the news I wanted. I had 100% my brother’s bone marrow and therefore the all clear! I could hardly take the news in; it felt so weird. Health wise I didn’t feel any different, but I was better. I had my last bone marrow test in 2000 and my consultant told me to go and get on with my life and to only come back if I felt poorly. Fortunately, I haven’t been back and now it is 2008. I have had a few side effects; cataracts being one of them. This has now been sorted out and my eye sight is fine. I have also been taking HRT to help prevent osteoporosis, a possible side effect from the total body irradiation. I am living life to the full and try to make the most of everyday. The relationship I was in at that time has now broken up, but to be fair my partner had really only known me for a while before I became unwell and once I got better things changed too much for us to carry on. However, I am now very happily married to a man who I actually first met through my brother back in the 80’s. Life is good!